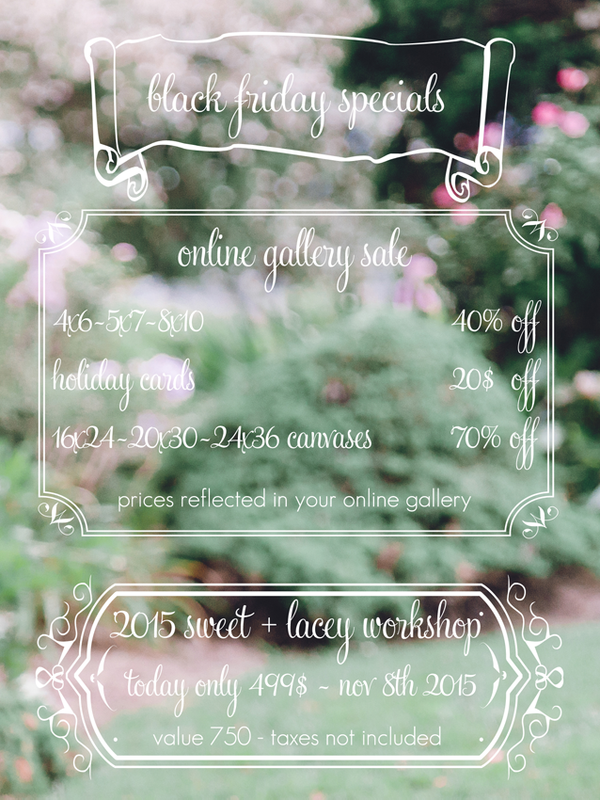 Today only..... the 2015 Sweet + Lacey Workshop... only 499$ (plus tax)--- November 8th is the date so mark your calendars!!!! After today... seats are 750 + tax!!!!! Online Gallery Sales until Monday -- for all current clients!!!! Here is a short peek at our 2014 Sweet + Lacey Workshop -- the guys over at Blueberry Creative are AWESOME and 'threw' together this quick piece for you today -- SO excited to see the final cut... can't wait to share it!!!! And I think I speak for everyone when I say.... the workshop was INCREDIBLE -- seeing all of the attendees share their photos and experiences in my online workshop group has been so amazing... I'm so grateful for such a great group of friends!